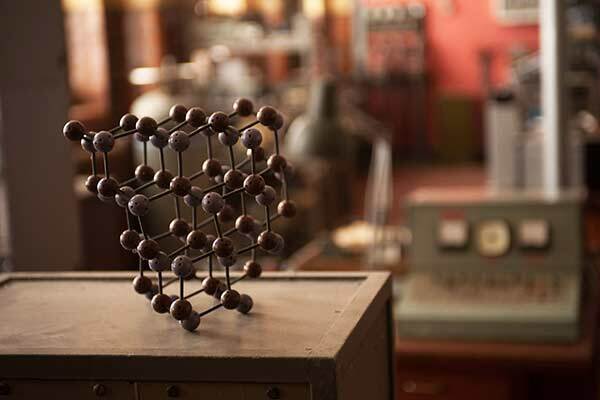 Photo by Liam Daniel ©2014 courtesy of Focus Features. All Rights Reserved. 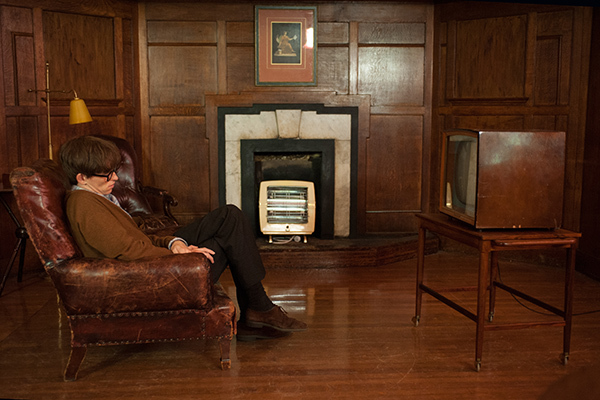 Photo by Liam Daniel ©2014 Focus Features. All Rights Reserved. Brian [Harry Lloyd], Rees [Gruffudd Glyn], Carter [Thomas Morrison] and Ellis [Michael Marcus]. So many fascinating details in the room! 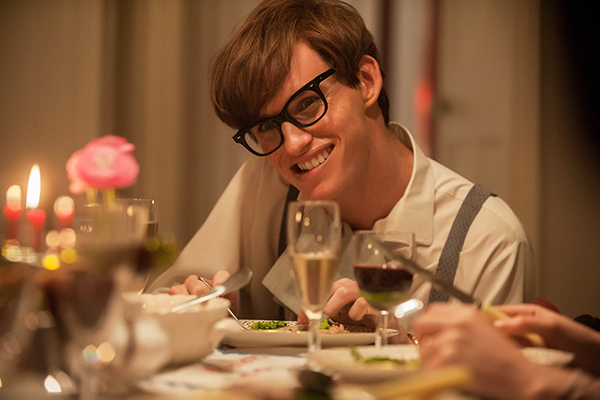 Eddie Redmayne as Stephen Hawking. 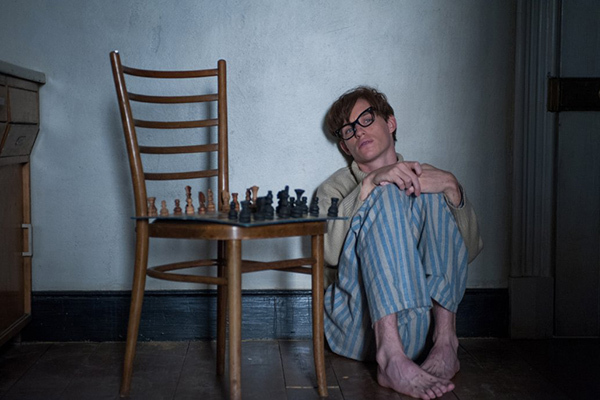 Photo by Liam Daniel ©2014 courtesy of Focus Features. All Rights Reserved. 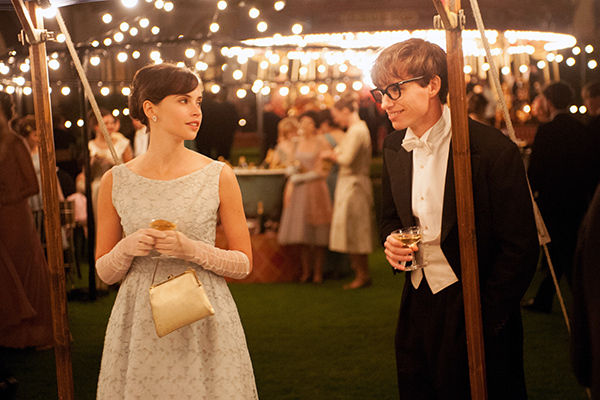 Eddie Redmayne, Oliver Payne, Felicity Jones. 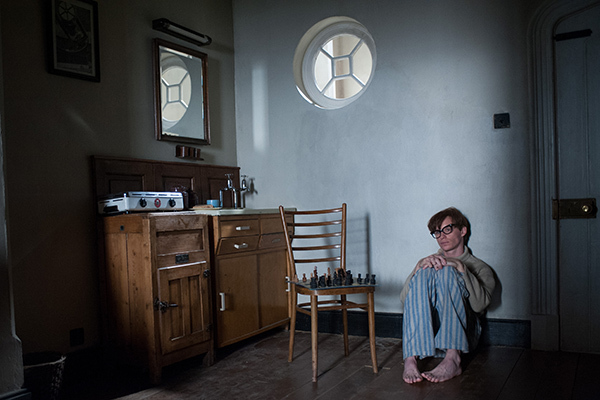 Photo by Liam Daniel ©2014 Focus Features. All Rights Reserved. 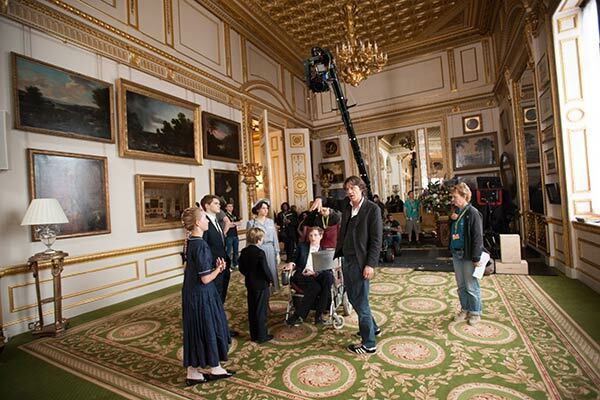 Director James Marsh and cast preparing scene where Stephen is to be knighted by the queen. 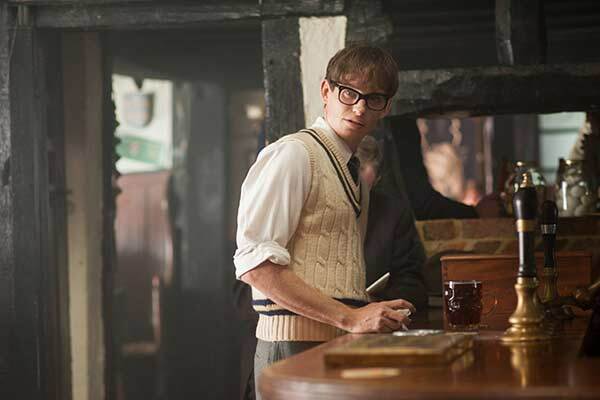 "However bad life may seem, where there is life there is hope..."
In 1963, as a physics-cosmology student at the storied U.K. university Cambridge, Stephen [Eddie Redmayne] is making great strides and is determined to find a “simple, eloquent explanation” for the universe. 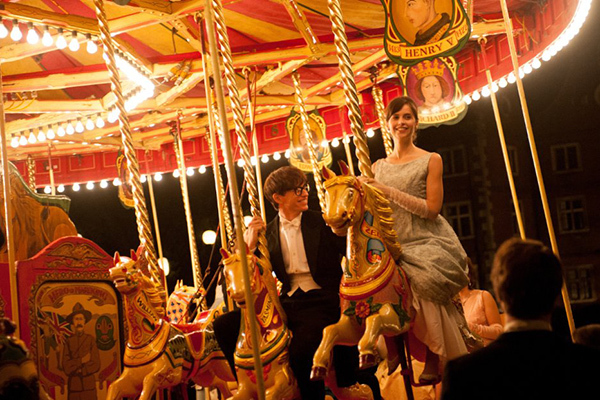 His own world opens up when he falls deeply in love with an arts major, fellow Cambridge student Jane Wilde [Felicity Jones]. But, at 21 years of age, he receives an earth-shattering diagnosis: motor neuron disease will attack his limbs and his abilities, leaving him with limited speech and movement, and will likely take his life within two years. Yet Jane’s love, fierce support and determination are unwavering, and they wed. With his new wife fighting tirelessly by his side, Stephen refuses to accept his diagnosis. 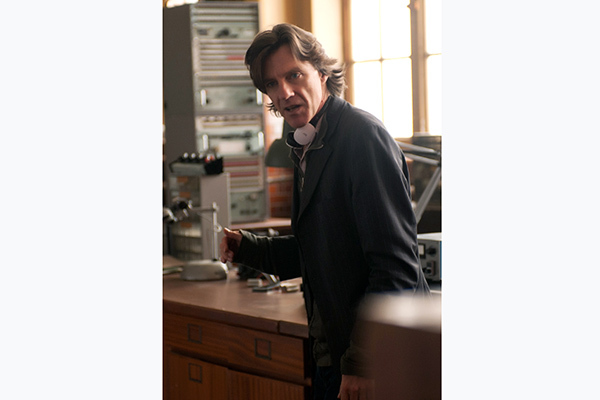 Jane encourages Stephen to finish his doctorate, which includes his initial theory of the creation of the universe. They start a family and Stephen embarks on his most ambitious scientific work, studying the very thing he now has precious little of—time. 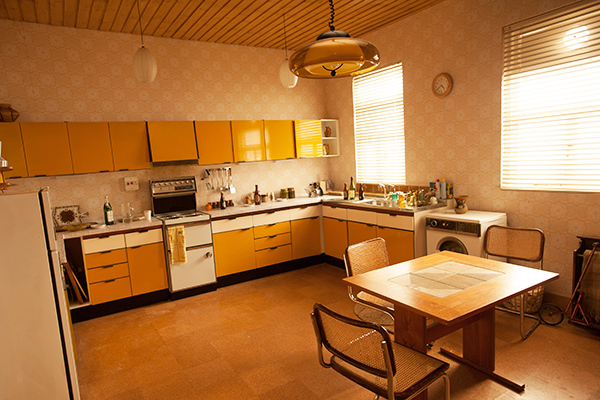 SET DECOR: How did the sets help you bring about your vision of the film? Director James Marsh: Well, what was interesting about this project and for anything that’s based on real life, particularly a true story, is that you have many clues you can use that exist either in photography or on film from different archival sources. I guess the main decision we had to make was how much to build. Should we try to find locations approximate to the real locations, or do we decide to build instead? 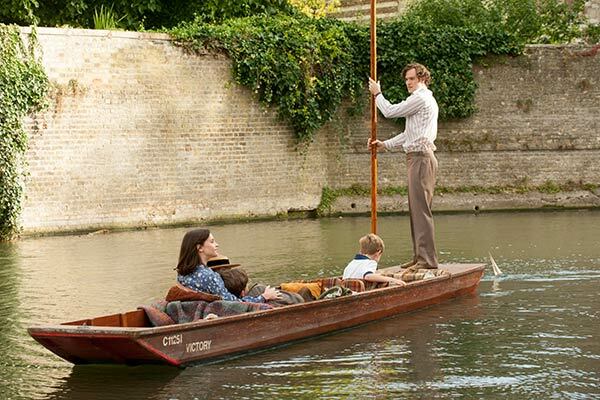 We agonized over one particular location, which was the second house in which the Hawkings live, their main home, a house in Cambridge with a nice garden. 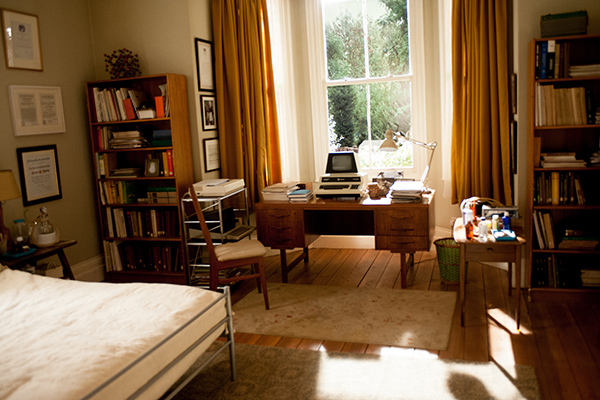 We found a house in London that was just like it, with exactly the same kind of garden arrangement…it was a gift. 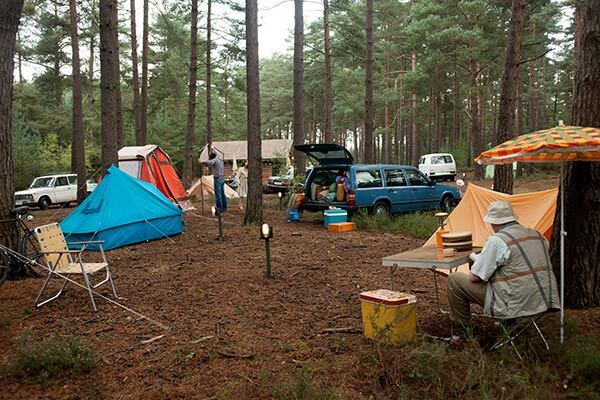 We began to plan to shoot there and began to measure it out, and it was great. However, the more we looked at it, the more we realized that we’re going to be in trouble if we shot in a real location. There are often sound worries that you have and this location was part of the flight path for Heathrow airport, which we didn’t realize until we came back in the afternoon! [He chuckles.] This is one deadly boring detail, but they switch the flight path between morning and afternoon for the residents to have relief, so in the morning, this location was free of air traffic, but in the afternoon, there was one every 30 seconds! 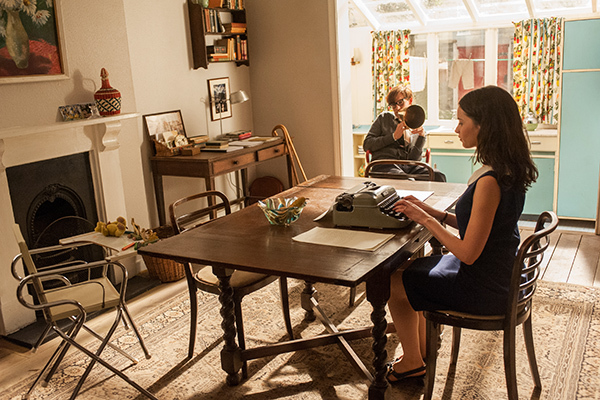 We got there at 2:30 in the afternoon and within 5 minutes, we all shook our heads and said, “This is not going to work.” So we then reproduced the house on stage in the London borough of Ealing. We also built onstage their first home, when they were newly married. 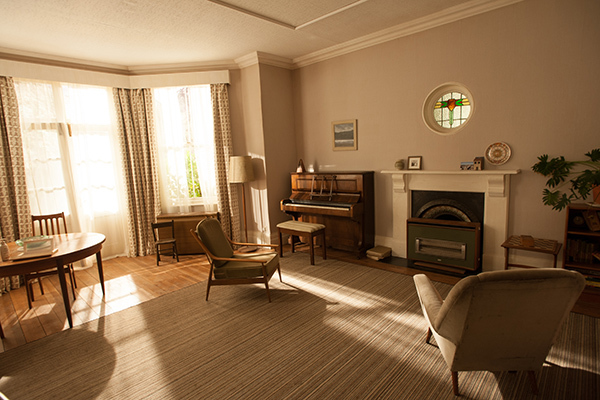 Production Designer JP Kelly was able to very carefully produce very much of what those houses would have been, with some creative adjustments in terms of space. So we opened that house up which gave us sightlines between 4 rooms, which felt very interesting…if somebody’s in a wheelchair, being able to see them from 4 different rooms is quite useful. Both houses were reproduced, in terms of décor, as per photographs we had. We felt it was quite accurate. The great thing about that was when Stephen and Jane’s daughter Lucy viewed the film, she was very emotional when she saw what we had done. She felt that she was actually watching remnants of the house she’d grown up in. That was a pleasing endorsement of the choices we’d made, that the children really responded and felt that we got it pretty much spot on. Marsh: Yes, exactly. And, if you know what a place should look like, you can find all sorts of odd little details. The chess set is a particularly significant small element. 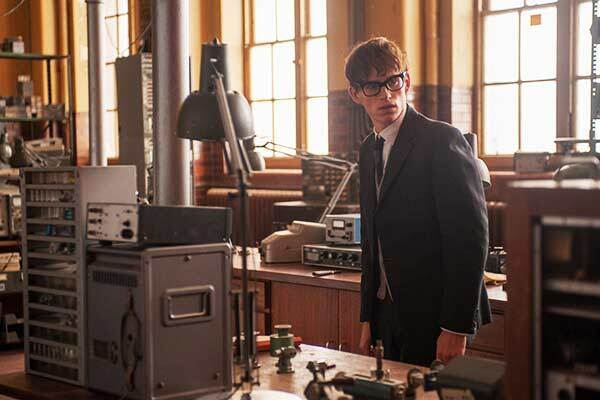 It was present in so many photographs that we saw of the second Hawking home, that it became a fixture in our house and, actually, throughout the film. We made use of it in several ways. At one point, we’re showing how difficult it is for Jane to manage the children and her work, and have her husband in a wheelchair. 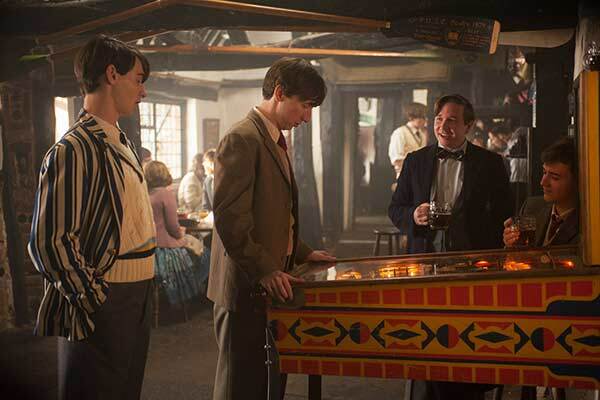 And you see Stephen merrily barrel into that chess set, knock it down and make a mess. So, there are details photographs can give you and it can be a very good starting point for the design and décor of the film. Period films invite you to get carried away, and there’s probably a slightly unhealthy tradition in British films to make that the foreground of a film and for it to be overwhelming. We wanted to go in the opposite direction. We wanted to make the world feel plausible and believable, but not so as to overwhelm the principal part of the story, which was the emotional life of the two characters and their marriage. It would have been a mistake to have been too precious about that. So that was another big principle going in…that’s what you do essentially when you start working with a designer and a DP, you establish these principles to guide you as you go. One of my main principles was that we weren’t going to suffocate people with lovely design and make it too tasteful. The key was that we wanted to make it very believable. Marsh: That was a very good observation. 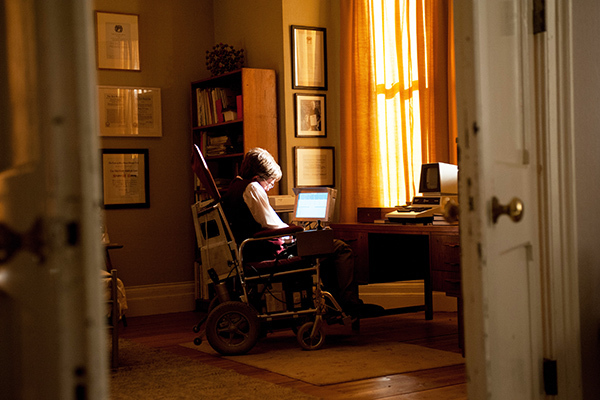 Obviously the environment is evolving, largely to accommodate Stephen’s disability…we made details to cover that. Things definitely do change in the house when Stephen becomes progressively more disabled. 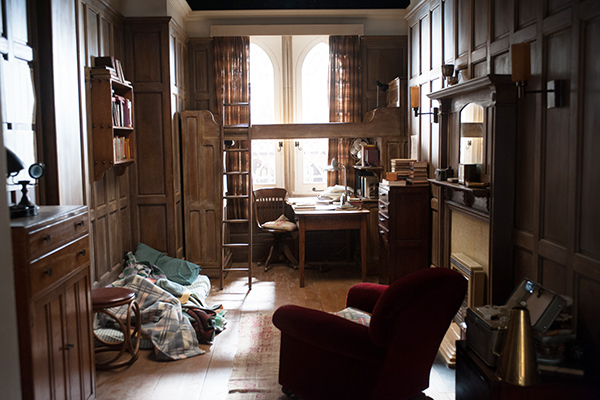 We even scaled up a couple of the rooms and the main elements in them, so he would look smaller, particularly after the tracheotomy when he can no longer speak. The wheelchairs were included in the design, as they were another significant part of the story. 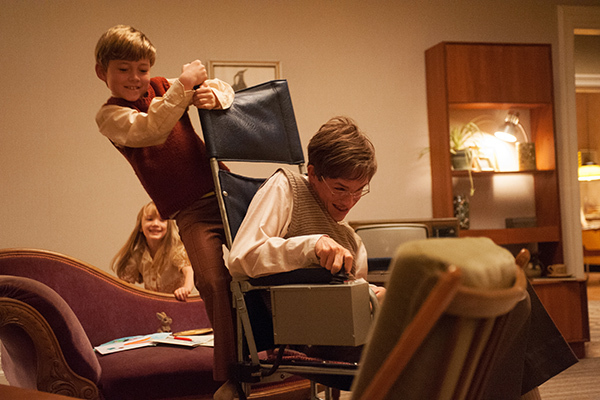 We built and customized 3 wheelchairs exactly as we found them in the archive films of Stephen, and made those practical so Eddie would indeed be able to drive the wheelchair. That was a design element, that wasn’t a technical. 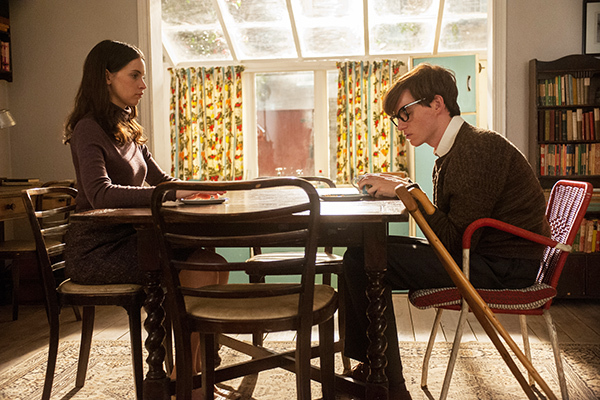 You also have to understand the colors of the wheelchairs, so that your costuming is going to sync up with that. In fact, another thing that was happening everyday was how the costumes were going to work within the sets, and we made a very coherent approach to that. We made Costume Designer Stephen Noble very aware of what our design choices were for each day so he would be able to costume the actors in such a way that, again, would allow the emotional story to come through and not overwhelm it with preciousness. Marsh: Yes, we definitely wanted it that way...especially when it’s a family and you have children and the house gets messier. We made it sort of obvious that the children had a presence in the house, which is shown by what we have in the rooms. As the children get older, that changes as well. But also, every film you do is a “period” film, even if it is contemporary life. And every period film is a combination of different periods. People don’t just have one modern home. They have remnants from what their grandparents would have given them, an armchair, this, that and the other. You try to make everything feel a little bit loose in that way. It’s not all coordinated, but more that classic style of most people’s houses. Marsh: You and me both! That was another principle I brought in: I needed to do it at the level that I understand as a non-scientist. 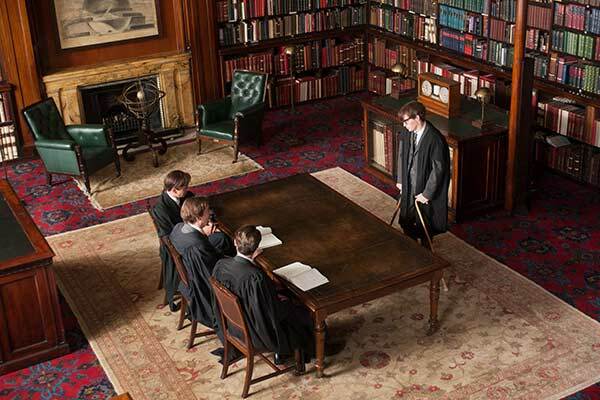 Cambridge gave us a texture, a sense of university life and of academic life…so much of Stephen’s life has been spent in academia. 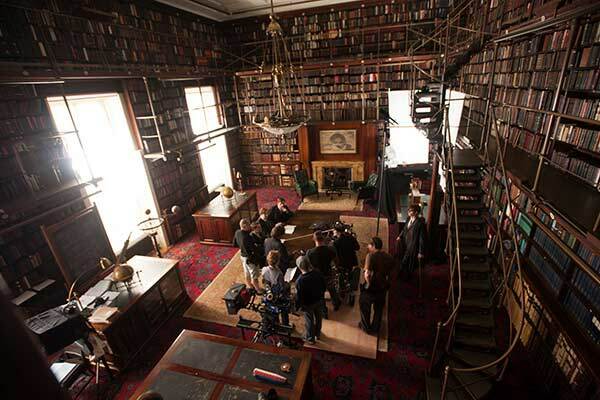 Some of those environments were shot in Cambridge and some in London, which has certain universities that have a nice correspondence to what you can find in Cambridge. 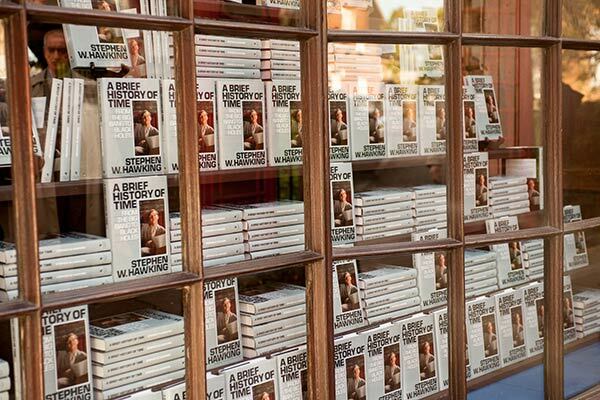 Our time in Cambridge was limited, just for financial reasons. 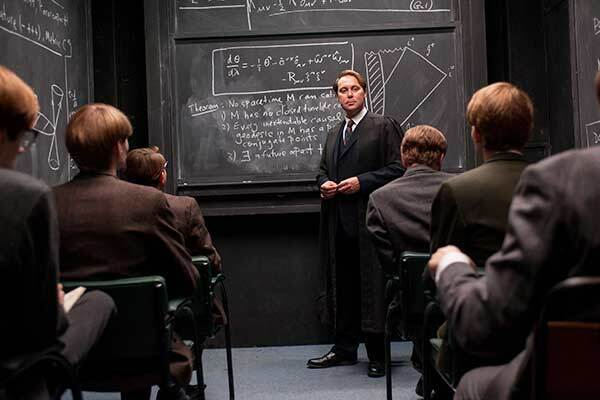 At one point Stephen does a lecture about a breakthrough with black holes early on, which we shot more or less in the same place where he actually did that lecture. That was important, when we could find an environment that works for filming, that is real. 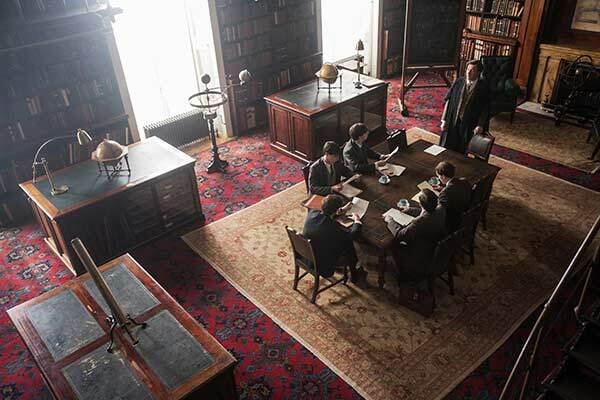 The modern Cambridge Department of Applied Mathematics and Theoretical Physics we actually shot in London. So we mixed and matched. Some of the exterior Cambridge scenes were shot in Harrow, which is a very elegant suburb of London. It has a very good school dating from the same period as some of the buildings of medieval Cambridge. As you know, in a film, you piece together your world in fairly odd ways. 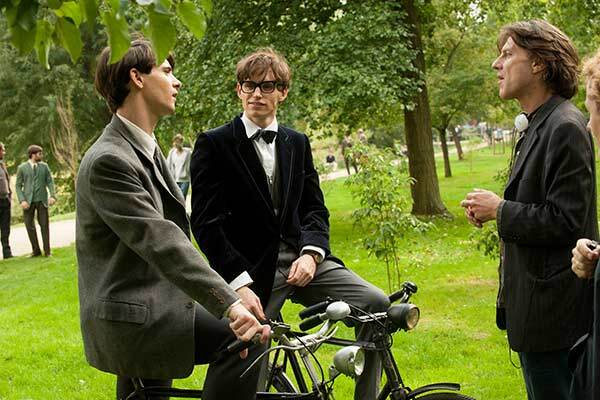 So there were several Cambridge parts that were shot in London. 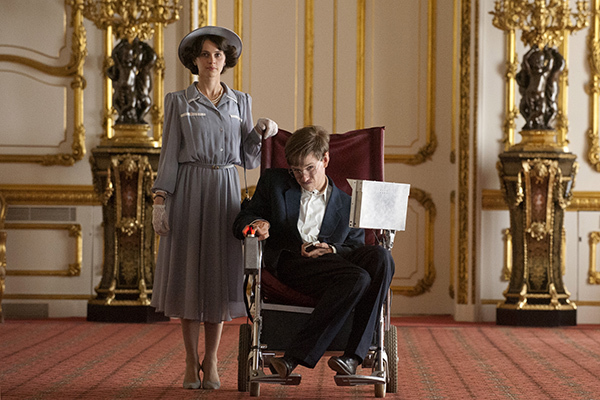 For example, there’s a sequence where Stephen is in a wheelchair, he and his friends have been drinking and they are pushing and carrying him through this environment and then put him in the arms of Queen Victoria…a large statue of her. We actually built that statue cast in plaster. So that’s what you do as you make your film. You find pieces of a world that you then put together. Just make sure the brickwork is cohesive with what you shot in Cambridge! Marsh: Now see, you’ve asked a very sane question that most people don’t mention. There are certain ways of approaching a film like this…we could have done it as a sort of kitchen-sink drama, which means we could have shot it in a fairly sad way and made it very gritty and starkly realistic. But if we’d done that, it wouldn’t have been true to the characters, who were very optimistic, or had to be, or tried to be. And in every photograph we could find of Stephen, and in the archive film as well, which was even more revealing, he’s very quick to smile. These people aren’t defeated by the circumstances. They were able to transcend them to some extent. That felt like the whole film should be full of light. And light was a big part of theoretical physics. How you measure light was an important part of this. So, as I said, we felt that the film should not be some dreary, miserable world. That’s not how Stephen lived, so it would have been dishonest to have done it that way. Thus, we went in the opposite direction and made the film warm, sunny, full of light. That felt like a way to capture the wit and optimism of the characters. Marsh: I’m glad it worked. You don’t have to be too symbolic with things like that, and yet at the same time you can give hints at the world that Stephen was trying to examine…which is the world of the universe…but not be pretentious about it. 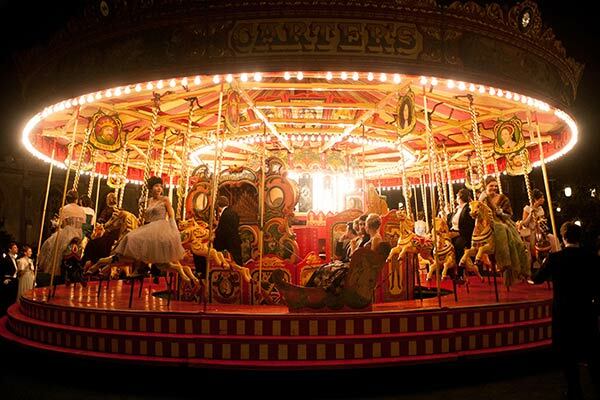 Marsh: I had seen some archived film of the May Ball in Cambridge around the same period we were doing our film, and there was a carousel like that. So we found one and brought it into that ball that we created. The whole May Ball was inspired by two or three archive photos that we had seen, plus Jane’s description of it in her book. It’s one of the last moments of innocence that she has. 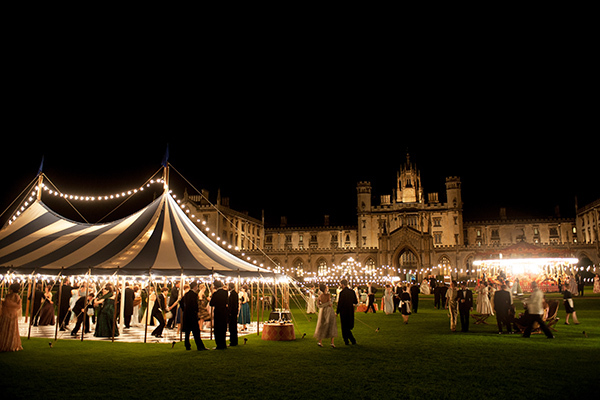 The May Ball, where he wouldn’t dance, is all true to her recollection. But we wanted to make that sequence more like a fairytale, as it is when you fall in love with somebody. That’s how you remember it. Another guiding principle we had was to make the film feel like a series of memories for the characters. So that sense of nostalgia that bleeds into the film was about having warm memories of an environment and a situation that meant something to you. The May Ball was absolutely expressing that idea. Marsh: I’m very glad you mentioned this. That was such a deliberate thing we did, and you’re the first person who caught up with that particular idea. I think some of these ideas gain attention from your sort of point of view and some of it’s subliminal. We put things in about nature. People wouldn’t have to necessarily articulate when they see it, “Oh, that’s a connection to that!” but it’s nice when that does land in the way you hoped it would. 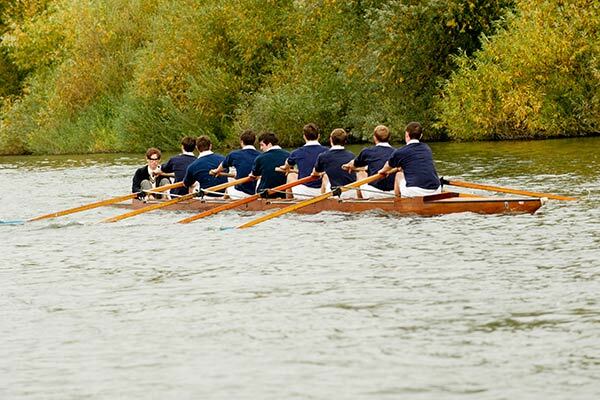 So that was very deliberate to have the one scene where he was vigorously participating with his rowing team and later, the other where he is totally helpless. In fact, the man who is going to become his wife’s lover, is now, indeed, in full control of the punt and able to do all this that Stephen no longer can do. There’s a poignancy to that little moment. And there’s a moment further in that sequence where he is at the sea, planted in his wheelchair. The sea is moving and he is not, and he feels like a stone that can’t move. These are all things that you do, hoping that they’re not too obvious, yet at the same time that they’re available in the imagery of the film for people to respond to without necessarily having to make it a big deal. Marsh: There is also a cosmic irony: Stephen is physically constrained and yet mentally he is able to go wherever he wants. His mind can and does travel to the outer limits of the universe, but his body is confined. 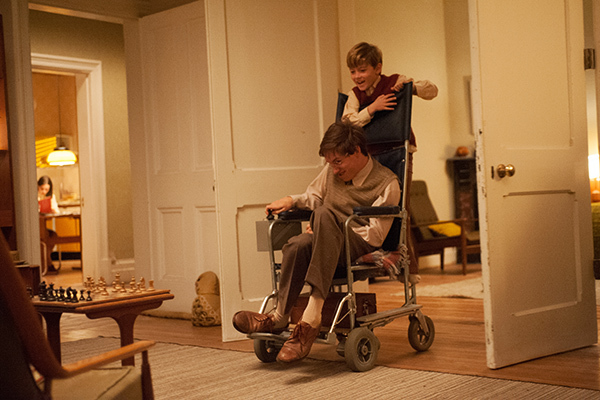 You know, once you have a main character in a wheelchair, anyone moving is a kind of comment on his inability to, particularly if they’re his children. There is a sequence where Stephen has to try to get up the stairs and his young son is at the top of the stairs, learning how to walk and stand up...and that contrast is so painful and emotional…the young infant up on his feet for the first time and his father going the opposite direction. Marsh: It’s Stephen’s character that changes the equation; his defiance of the illness with humor, perseverance and grit makes this story the opposite of a tragedy in the end. SET DECOR: Is there anything we haven’t mentioned and should? 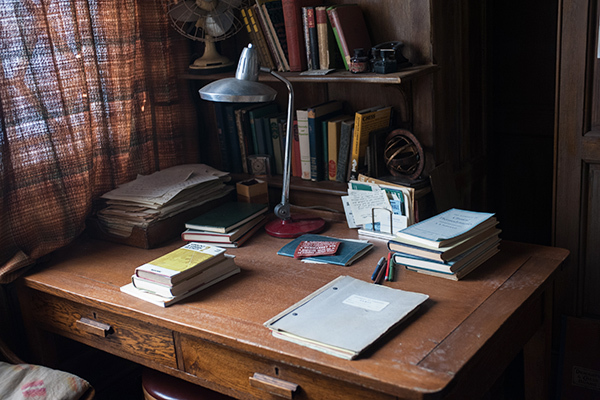 Marsh: Well, I think, in a sense, one could step back and talk about the general collaboration that on a daily basis involved the cinematographer, the set decorator and JP’s design vision for the film. The actors have to feel comfortable and right in their spaces. They shouldn’t be daunted by them or feel like they can’t move around freely within them because of something ornamental in some way. 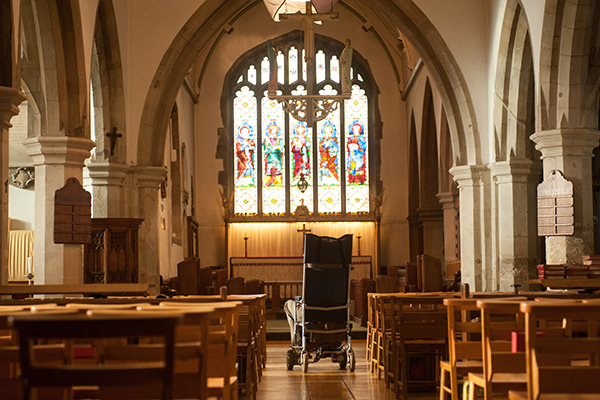 So we had very robust sets that you could kind of clatter a wheelchair into and everything would still stand and be available for the next shot, which is a small thing but an important thing. 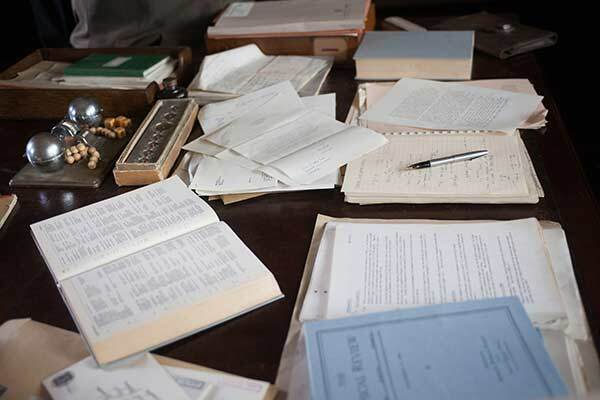 The sets, with all of their elements, had to work…that was the foreground of our story, with this emotional pull of that kind of marriage with these various pressures. So the actors and the cinematographer had to really want to shoot in those places. And they always did, which I think shows you how well the sets were done. The sets were so easily and happily embraced by the actors, they felt very at home. We all liked being in there and I loved being in the main room of the house. I’d have my lunch on set often. It’s a testament of how much I enjoyed the work of the designer and decorator that I was very happy to have my lunch in those sets! I’m very proud of the work everyone did on this film and am pleased that they are getting proper credit for it.